I was so excited for this product to arrive. The clever pan-on-pan design seemed so simple; I wondered why these pans haven't been popular for ages. The TV commercial that prompted me to buy Perfect Pancake showed a hand flipping the pan to make over-hard eggs without breaking the yolks. Seemed easy. I tried it. One flip of the pan and my eggs slid out of the pan, across the stove and onto the floor. So it didn't work for eggs. I could forgive that; afterall I bought my dual-pan under the name the Perfect Pancake maker. I tried making pancakes several times. Regardless of batter-consitency, all of my pancakes came out thick and hearty. Even a crepe-thin coating produced thick silver-nickels. Final verdict: Beyond the novelty and fun-design, this product is good for only one thing: thick pancakes. Forget making eggs or more delicate batter-cakes. The real perfect pancake maker is still a solid pan and a spatula. What do you think of Perfect Pancake Maker? Try using butter, Pam or a teaspoon of oil. For both eggs and pancakes. You will be surprised. 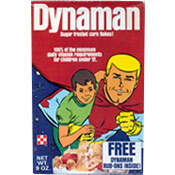 This product makes big mess all over the stove and the heart-shaped one was a joke! I got this as a present for Christmas. Was so excited. It took so long for them to get done and I actually burnt them. It seemed a waste of my time. They did come out easily though. Still wouldn't recommend it. I love the Perfect Pancake Maker! We made hot sandwiches for years, they always turned out perfect and delicious. But then I dropped it down the basement stairs. So sad. Have been looking to purchase a new one but haven't found it anywhere. I would recommend this pan to everyone. It's easy to use and quick clean up. So if you wait until the eggs set and then flip, it works fine. Do the eggs get hard? The biggest waste of money and metal. I took mine, used it to make one pancake, took it off the stove and threw it outside. I liked it. I can finally make a decent shaped pancake now... wow. Looks cool. Too bad it doesn't work so good. We have 2 of these, 1 works perfectly and doesn't stick at all, the other one no matter what you do the pancakes stick to it (it is in great looking condition)... Also, the handles seem to break fairly easily. I now use a regular pan, much more convenient. My husband and I love this. Son gave it to us. Glad I tried it. Best, best pancakes ever. My wife has had this product for 5 years now and it makes perfect pancakes. A lot of people have criticized it, but a local news caster here in Jacksonville proved to a non believer that it really works. You just have to be smarter than the pan. Please don't buy this product. All its good for is making a huge mess all over the stove. Non stick, what a joke even after greasing the pan, it still stuck. I gave this thing one last try yesterday and after making a mess with it I literally broke it in half. Use a good griddle. I am not a fan of pancakes, but someone gave this to me as a wedding gift. I used it for about 4 years for Tuna Melts, grilled cheese, eggs, etc.... I love it and i was sad when all the non stick coating fell off. I am buying a new one and hope it is as fabulous as my original! The commercials specifically mention the ability to make omelets. I tried making one, and egg goes all over the stove and floor. Worthless piece of garbage, do not buy. I made hotdogs in the perfect pancake pan and they turned out yummy. We bought our first pancake maker about 3 years ago and used it until it fell apart. 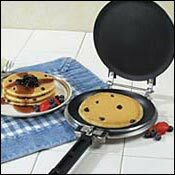 We purchased and second one and love it for pancakes, grilled cheese sandwiches, I even fry eggs in it. It is wonderful... so wonderful I'm getting another one just to have as a back-up. I had to remove the heating things they had and install new ones that keep the seal. Worst Product i have EVER had. It sticks to the pan, and it is a big wast of money. I have had my perfect pancake maker for over 6 years at first it sat in cupboard and I never used it. About 2 years ago I started using it and wow I can't believe how big and wonderful the pancakes turn out. They are bigger and better than resturants. I need a new one and I was so pleased to see that I can get a new one. I thought I have had this for so long and no way I'll find one now. I'm am so excited that I can replace it. When I moved into my new apartment, one of these pans had been left behind by the last tenant. I tried it out today, and it worked beautifully! The first one I made, however, got stuck to the pan when i tried flipping... but after coating it with more butter, the rest of the crepes came out smoothly. I used a recipe found here. They were perfectly thin and delicious. If your pancakes came out too thick maybe you used the wrong kind of recipe? You only need a few tablespoons of batter and then spread it around thinly in the pan. I'll definitely be using this again, and I look forward to trying it out on grilled cheese and tuna melts! I DON'T EVEN LIKE PANCAKES! HOWEVER I DO LIKE GRILLED CHEESE. THIS PRODUCT MAKES THE MOST FABLOUS SANDWICHES WITHOUT SQUASHING THEM THAT I HAVE EVER HAD. MINE ALSO FELL APART AFTER ABOUT 3 YEARS OF SERVICE I AM NOW IN THE MARKET FOR ANOTHER ONE, OR TWO. WHERE CAN I GET IT. Yeah, I got sucked in, too. The results are neither perfect nor pancake. I'll stick to my griddle! Oh, give them a break. A friend had one of these pans and didn't like it so she let me try it. What a waste of money! Who wants to make one pancake at a time - and a really thick one at that. Like Mr.Breakfast, I'll take a good pan or griddle any day.